One of our most popular patterns has now come to the trivet! We love this star design, which will look beautiful in your kitchen, on your dining room table or hanging on the wall. This is a wonderful way to bring your love for fair trade into your living space. 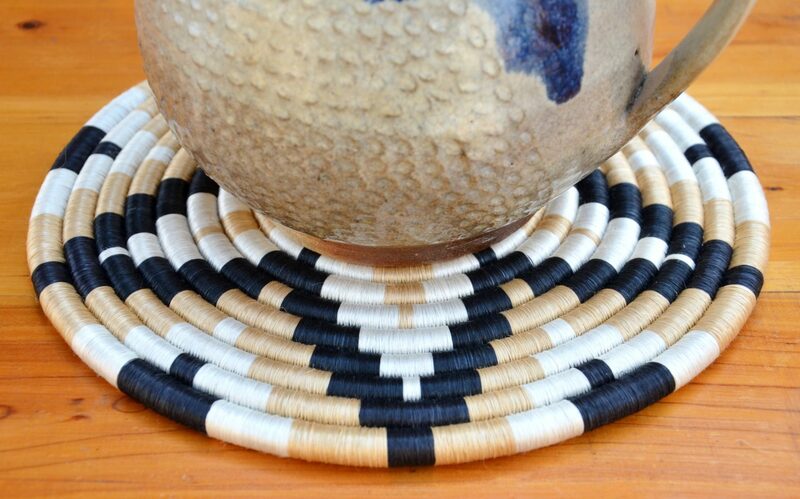 Each trivet begins with the gathering of forest grasses and large sisal leaves. Once the sisal fibers have been extracted from the leaf, cleaned, dyed, and dried, the artisans are ready to begin. The sisal fibers are threaded around and around a core of forest grasses, the design taking shape bit by bit. In the end, you have a beautiful and useful addition to your dinner table. Hand woven trivets also make a lovely housewarming gift. Pair one with a set of coasters or napkin rings for a fun and memorable wedding present. Come and meet the weavers of your trivet in their feature profile. They are skilled and determined women! Woven from natural sisal fibers threaded over a core of locally-gathered forest grasses. The tea color is created when the sisal fibers are steeped in Rwandan tea leaves! We’ve also attached a loop for hanging your trivet up. Care: Wipe with a damp cloth in the direction of the sisal fibers. More than 4554 stitches are hand woven into every medium bowl. And with every stitch, the artisan had her family in mind. With her fair wage income, she provides for the wellbeing of her household in the Rwandan countryside. Nourishment, health, education, and dreams for a bright future- your basket holds much love.